Everyone loves unwrapping gifts but at My Shiny Shop we also love to wrap them! If you want to surprise someone special with a gift we will do the wrapping for you and we will do it for FREE! Just tick gift wrapping at the checkout and chose the colour of wrapping paper you like. 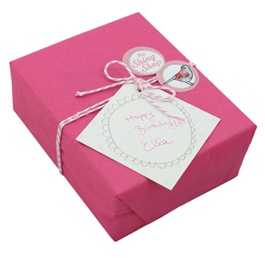 If you like you can add a gift message in the box provided and we will hand write it for you on a simple gift tag. You can even add one of our greeting cards to your order and we will hand write your message in there if you prefer. We promise to write very neatly for you! 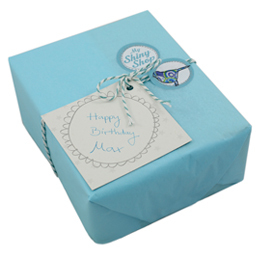 If you only need one of your items gift wrapped and you have ordered more than one, please let us know by emailing hello@myshinyshop.com or calling us on +44 (0) 7884 001338. Any questions about this free service? Drop us an email hello@myshinyshop.com or call us on +44 (0) 7884 001338 and we will be happy to help you straight away! Oh, and here are two photos of wrapped My Shiny Shop presents to show you how pretty they are!